The Index opened flat and stayed in a narrow range for the better part of the day. Short covering towards the end saw the index spurt upwards to close near the highs of the day at 8368.50, gain of 50.10 points. The broader market was strong, with 1054 advances to 440 declines. The OI table range is at 8000-8500. 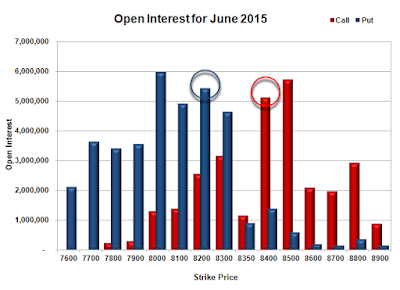 Call option 8300-9000 added huge 15.65 lacs OI with short covering seen at 8200 and below strike prices. Put option 8400-8000 added huge 12.90 lacs OI with profit booking seen at 7900 strike price. Nifty Open Interest is at 1,63,29,550 up by 11,28,925, with increase in price, most probably huge long build-up. 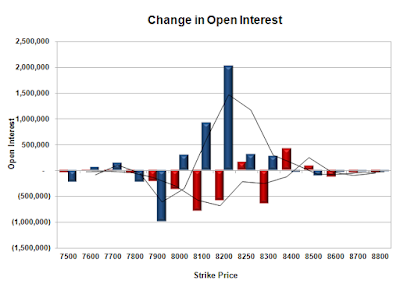 Bank Nifty Open Interest is at 15,13,575 up by 24,375, with increase in price, most probably long build-up. FII’s bought 4.24 lacs Futures, which includes 33673 contracts long build-up and 16720 contracts short build-up, with increase in net OI by 50393 contracts (includes 71679 longs to 54726 shorts for the day) and the Average Price comes to 8537.59. FII’s Index future open contract as on date is 456168 Longs to 156234 Shorts, Net Long 299934 contracts. Initial support at 8300, with OI of 29.22 lacs and below that at 8200 with OI of 33.86 lacs. Initial resistance still at 8400, with OI of 30.29 lacs and above that at 8500 with OI of 34.85 lacs. 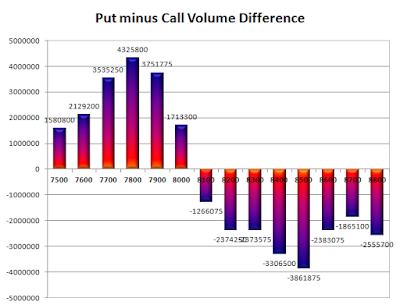 Day Range as per Option Table is 8278 - 8428 and as per VIX is 8294 - 8443 with 8348 as the Pivot. The Index opened weak on the back of bad global cues and went on to make low of 8196. Value buying around the lows saw the index cover most of the loss but still closed in red at 8318.40, loss of 62.70 points. The broader market was very weak, with 345 advances to 1158 declines. The broader range at start of series is at 7900-8600. Call option 8100-8600 added huge 16.31 lacs OI with profit booking seen at 8700 and above strike prices. Put option 8300-7700 added huge 29.37 lacs OI with short covering seen at 8400 and above strike price. 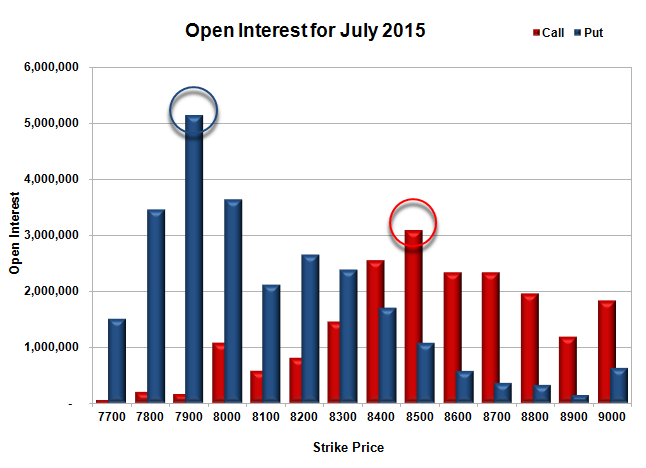 Nifty Open Interest is at 1,52,00,625 up by 13,76,275, with decrease in price, most probably huge short build-up. 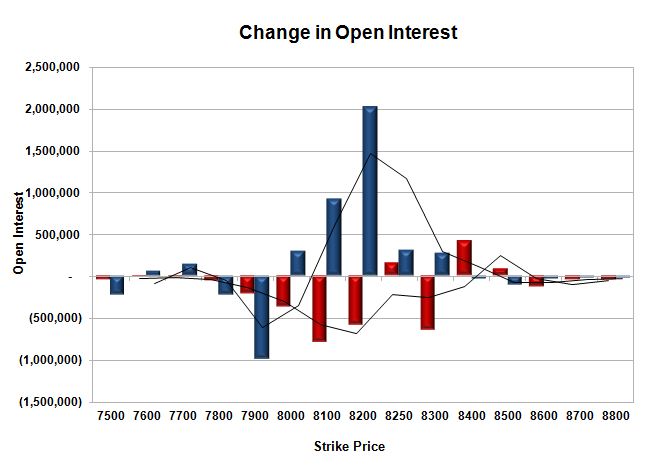 Bank Nifty Open Interest is at 14,89,200 up by 26,525, with decrease in price, most probably short build-up. FII’s bought huge 8.78 lacs Futures, which includes 53424 contracts long build-up and 18288 contracts short build-up, with increase in net OI by 71712 contracts (includes 120798 longs to 85662 shorts for the day) and the Average Price comes to 8497.40. FII’s Index future open contract as on date is 422495 Longs to 139514 Shorts, Net Long 282981 contracts. 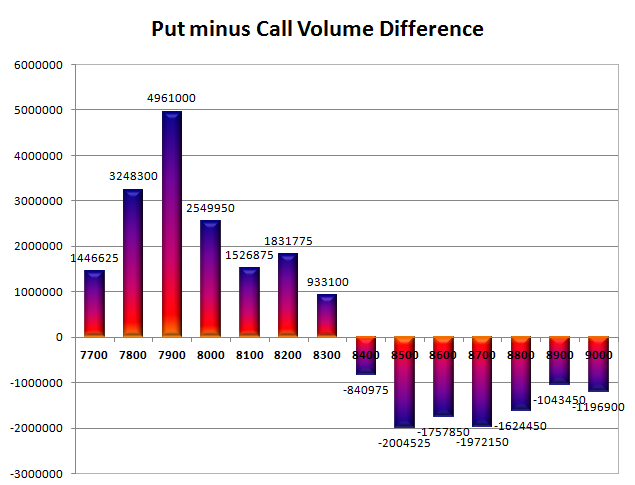 Initial and very good support at 8200, with OI of 32.14 lacs and below that at 8000 with OI of 44.26 lacs. Initial resistance at 8400, with OI of 28.62 lacs and above that at 8500 with OI of 31.01 lacs. Day Range as per Option Table is 8214 - 8370 and as per VIX is 8243 - 8394 with 8281 as the Pivot. The Index opened flat to negative but saw huge short covering from the onset to scale the psychological level of 8400 but closed just below at 8398.00, gain 37.15 points. The broader market was just negative, with 723 advances to 747 declines. The broader range at start of series is at 8000-8600. Call option 7800-9000 added huge 44.54 lacs OI. Put option 9000-7700 added huge 40.91 lacs OI. Nifty Open Interest is at 1,38,71,600 up by 48,44,925, with increase in price, 100% rollover with huge long build-up. Bank Nifty Open Interest is at 16,14,775 up by 7,33,550, with increase in price, 100% rollover with huge long build-up. FII’s bought huge 25.14 lacs Futures, which includes 128094 contracts long liquidation and 233467 contracts short covering, with decrease in net OI by 361561 contracts (includes 233948 longs to 133369 shorts for the day) and the Average Price comes to 8830.24. 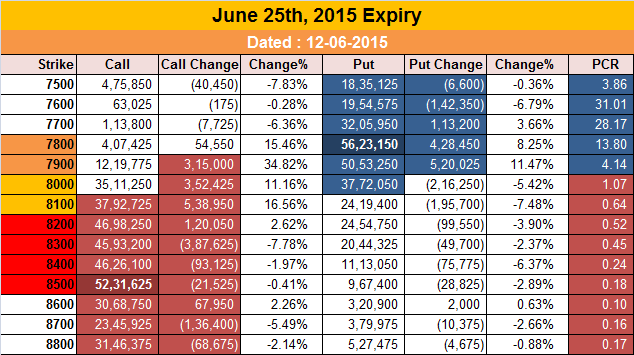 FII’s Index future open contract as on date is 370866 Longs to 115431 Shorts, Net Long 255435 contracts. Initial support at 8300, with huge OI addition of 9.07 lacs and below that at 8000 with OI of 33.33 lacs. Initial resistance at 8400, with OI of 24.41 lacs and above that at 8500 with OI of 25.58 lacs. 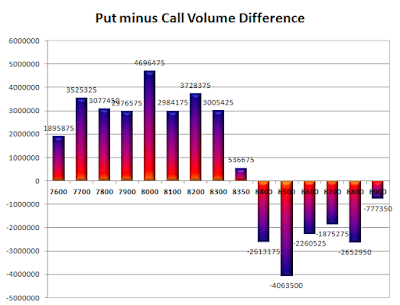 Day Range as per Option Table is 8313 - 8458 and as per VIX is 8328 - 8468 with 8384 as the Pivot. The Index opened positive around 8400 and stayed positive for the major part of the day but saw huge short build-up in the last hour of trade to sink below 8350 but closed just above at 8360.85, loss 20.70 points. The broader market was negative, with 624 advances to 859 declines. 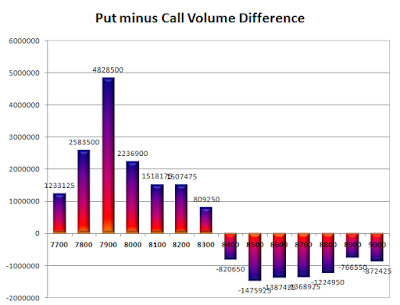 The broader range as per Option Table for expiry is at 8200-8500. 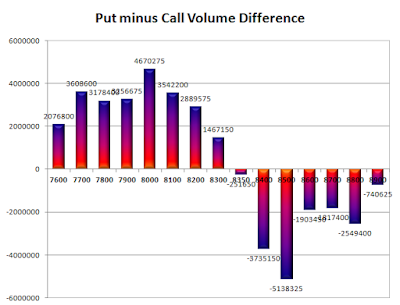 Call option 8350, 8450 added 6.98 lacs OI with huge short covering seen at 8300 and below strike prices. Put option 8500-8350 added 8.32 lacs OI with profit booking seen at 8300 and below strike prices. Nifty Open Interest is at 1,13,17,425 down by 4,91,050, whereas next series added 27.73 lacs with decrease in price, 100% roll-over with huge short build-up. Bank Nifty Open Interest is at 16,73,125 down by 3,42,350, whereas next series added 2.07 lacs with decrease in price, most probably roll-over with huge long liquidation. FII’s bought huge 16.03 lacs Futures, which includes 113146 contracts long build-up and 49010 contracts short build-up, with increase in net OI by 162156 contracts (includes 257188 longs to 193052 shorts for the day) and the Average Price comes to 8792.40. 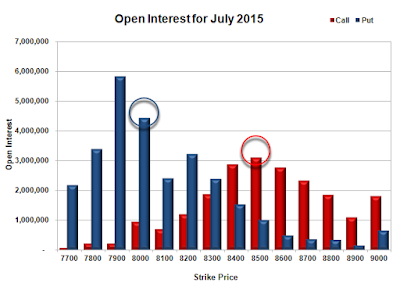 FII’s Index future open contract as on date is 498960 Longs to 348898 Shorts, Net Long 150062 contracts. 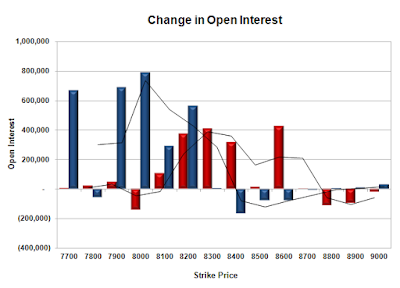 Initial support stays at 8300, with OI of 49.65 lacs and below that at 8200 with highest OI of 51.02 lacs. 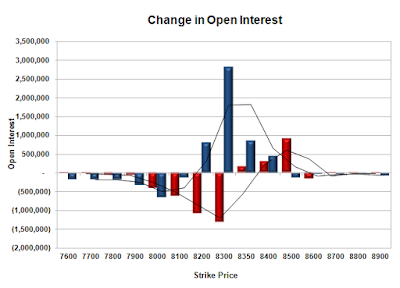 Initial resistance at 8400, with OI of 46.92 lacs and above that at 8500 with OI of 47.20 lacs. Day Range as per Option Table is 8299 - 8442 and as per VIX is 8291 - 8431 with 8374 as the Pivot. The Index opened strong around 8377 and went on to make high just below 8400, but small profit booking saw the index back to previous days close level. Smart buying saw the index close positive at 8381.55, gain 28.45 points. The broader market was positive, with 858 advances to 619 declines. The broader range as per Option Table is at 8200-8500. 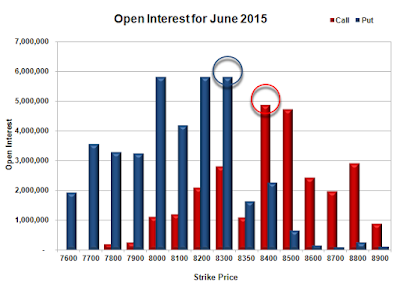 Call option 8600 added 3.27 lacs OI with huge short covering seen at 8300 and below strike prices. Put option 8400-8200 added huge 31.77 lacs OI with profit booking seen at 8100 and below strike prices. 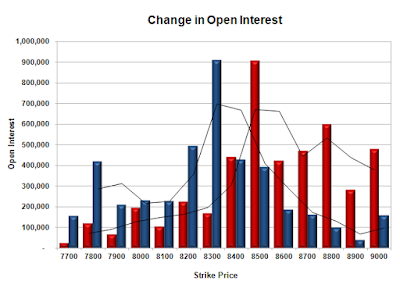 Nifty Open Interest is at 1,18,08,475 down by 11,23,975, whereas next series added 20.04 lacs with increase in price, most probably rollover with huge long build-up. Bank Nifty Open Interest is at 20,15,475 down by 2,81,550, whereas next series added 2.06 lacs with increase in price, most probably rollover with huge short covering. FII’s bought huge 16.24 lacs Futures, which includes 44677 contracts long build-up and 20293 contracts short covering, with increase in net OI by 24384 contracts (includes 200826 longs to 135856 shorts for the day) and the Average Price comes to 9068.38. FII’s Index future open contract as on date is 385814 Longs to 299888 Shorts, Net Long 85926 contracts. 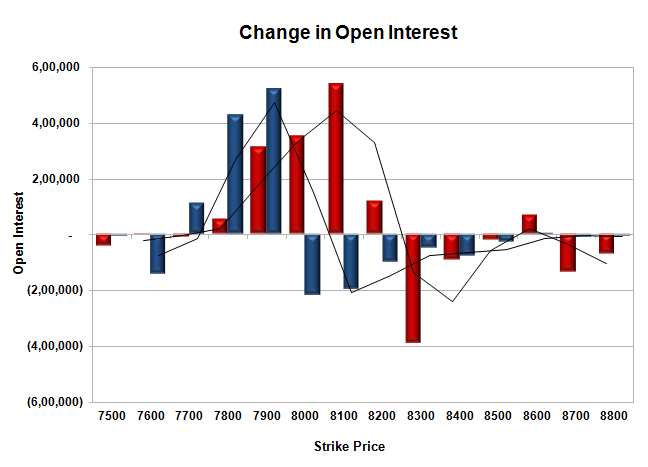 Initial and best support stays at 8300, with highest OI of 58.21 lacs and below that at 8200 with OI of 58.20 lacs. Initial and best resistance at 8400, with OI of 48.77 lacs and above that at 8500 with OI of 47.29 lacs. Day Range as per Option Table is 8296 - 8452 and as per VIX is 8316 - 8448 with 8372 as the Pivot. The Index opened strong around 8259 and stayed strong throughout the entire session of trade with a small profit booking towards the end and closed strong at 8353.10, huge gain 128.15 points. The broader market was also strong, with 1063 advances to 456 declines. 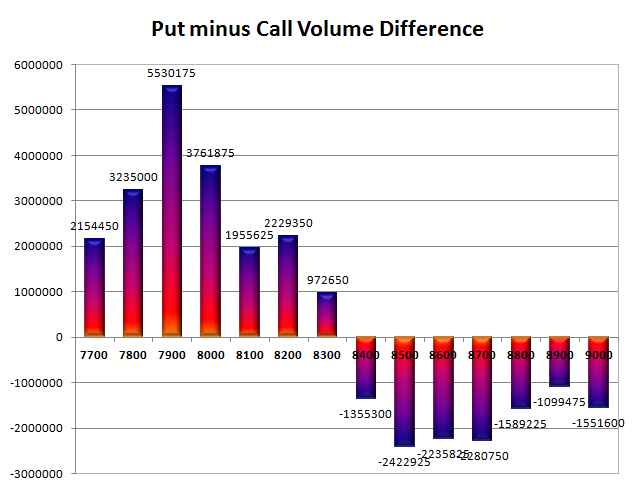 The broader range as per Option Table moved up to 8000-8500. 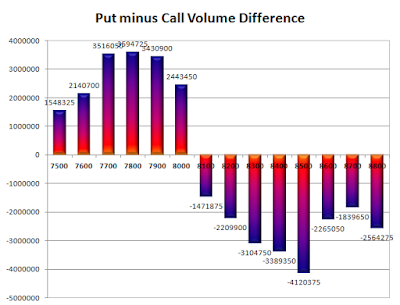 Call option 8350-8500 added huge 13.67 lacs OI with short covering seen at 8300 and below strike prices. Put option 8400-8200 added huge 49.10 lacs OI with profit booking seen at 8100 and below strike prices. Nifty Open Interest is at 1,29,32,450 down by 20,81,525, whereas next series added 13.47 lacs with increase in price, most probably rollover with huge short covering. Bank Nifty Open Interest is at 22,97,025 down by 1,14,825, whereas next series added 1.97 lacs with increase in price, most probably 100% rollover with huge long build-up. FII’s bought huge 14.59 lacs Futures, which includes 7597 contracts long build-up and 50744 contracts short covering, with decrease in net OI by 43147 contracts (includes 295494 longs to 237153 shorts for the day) and the Average Price comes to 9100.12. FII’s Index future open contract as on date is 341137 Longs to 320181 Shorts, Net Long 20956 contracts. 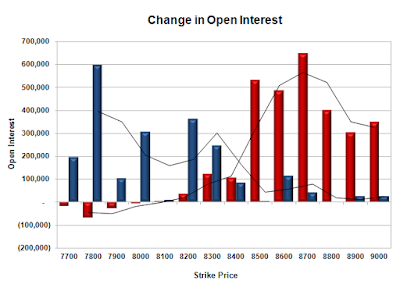 Initial support now at 8300, with OI of 46.32 lacs and below that at 8200 with OI of 54.43 lacs. Initial and good resistance at 8400, with OI of 51.14 lacs and above that at 8500 with OI of 57.37 lacs. 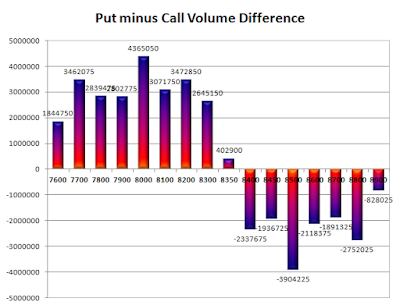 Day Range as per Option Table is 8255 - 8410 and as per VIX is 8285 - 8421 with 8327 as the Pivot. The Index opened strong above 8200 and stayed positive throughout the entire session of trade and closed strong at 8224.95, gain 50.35 points. The broader market was positive, with 818 advances to 675 declines. 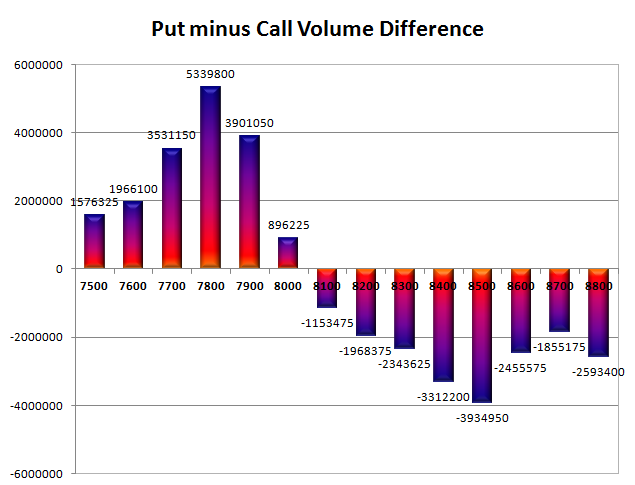 The broader range as per Option Table moved up to 8000-8500. 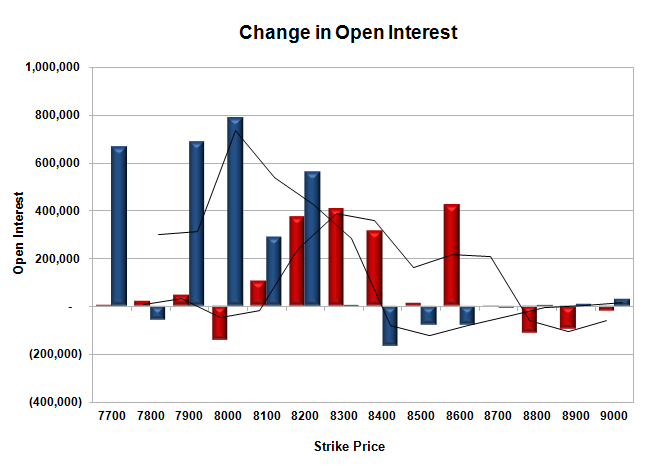 Call option 8250, 8400-8500 added 6.61 lacs OI with short covering seen at 8200 and below strike prices. Put option 8300-8000 added huge 38.38 lacs OI with profit booking seen at 7900 and below strike prices. Nifty Open Interest is at 1,50,13,975 down by 8,59,500, whereas next series added 2.48 lacs with increase in price, most probably small rollover with huge short covering. Bank Nifty Open Interest is at 24,11,850 down by 99,875, whereas next series added 0.43 lacs with increase in price, most probably small rollover with huge short covering. FII’s sold 1.89 lacs Futures, which includes 12452 contracts long liquidation and 4883 contracts short covering, with decrease in net OI by 17335 contracts (includes 104102 longs to 111671 shorts for the day) and the Average Price comes to 8744.78. FII’s Index future open contract as on date is 333540 Longs to 370925 Shorts, Net Short 37385 contracts. 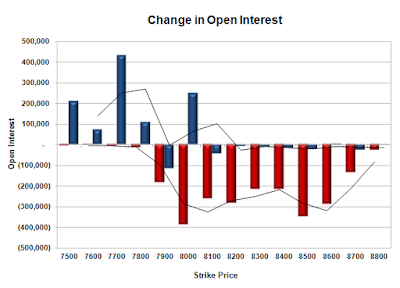 Initial support now at 8200, with OI of 46.42 lacs and below that at 8100 with OI of 50.57 lacs. Initial resistance at 8300, with OI of 44.86 lacs and above that at 8400 with OI of 48.18 lacs. 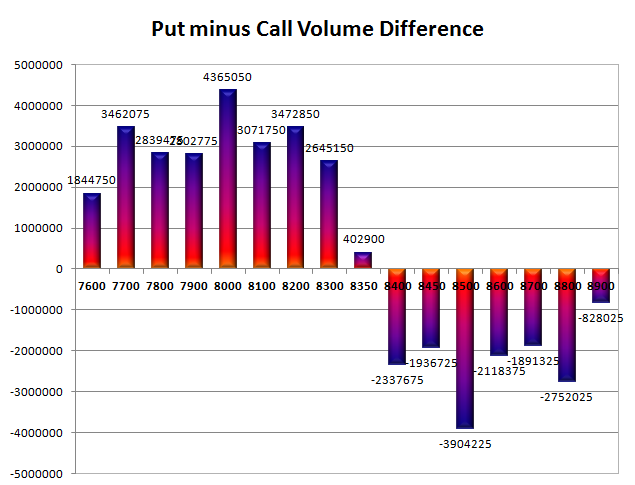 Day Range as per Option Table is 8150 - 8297 and as per VIX is 8160 - 8290 with 8224 as the Pivot. The Index opened strong above 8100 and stayed positive throughout the entire session to close just below the highs of the day at 8174.60, gain 83.05 points. The broader market was positive, with 987 advances to 476 declines. 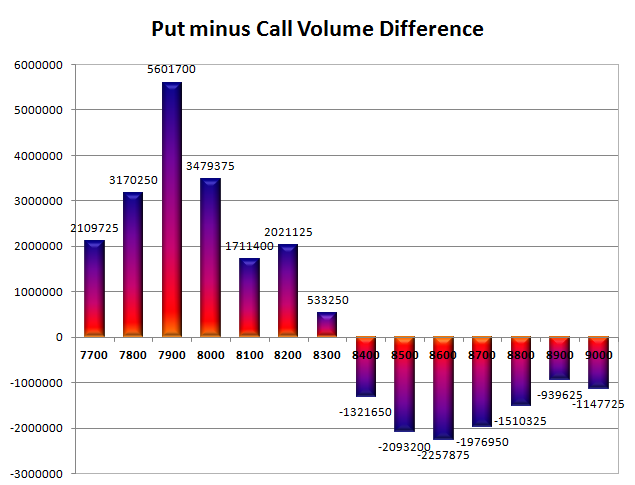 The broader range as per Option Table moved up to 8000-8500. 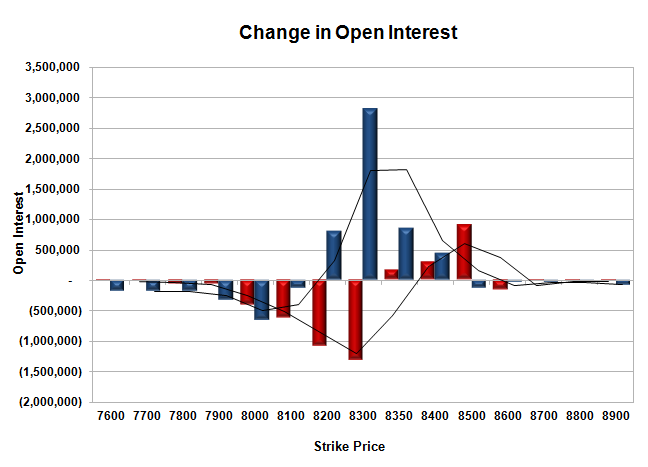 Call option 8300 added 2.45 lacs OI with short covering seen at 8100 and below strike prices. Put option 8200-7900 added huge 38.67 lacs OI with profit booking seen at 7800 and below strike prices. Nifty Open Interest is at 1,58,73,475 up by 2,29,025, with increase in price, most probably long build-up. 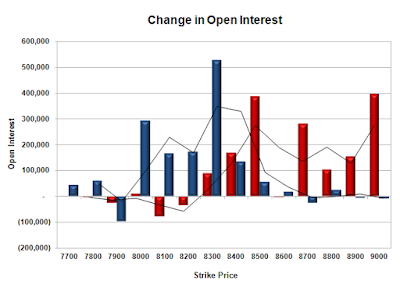 Bank Nifty Open Interest is at 25,11,725 down by 2,49,375, with increase in price, most probably huge short covering. 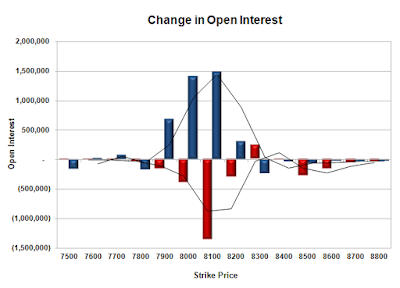 FII’s bought 3.58 lacs Futures, which includes 32032 contracts long build-up and 17711 contracts short build-up, with increase in net OI by 49743 contracts (includes 174842 longs to 160520 shorts for the day) and the Average Price comes to 8636.77. FII’s Index future open contract as on date is 345992 Longs to 375808 Shorts, Net Short 29816 contracts. 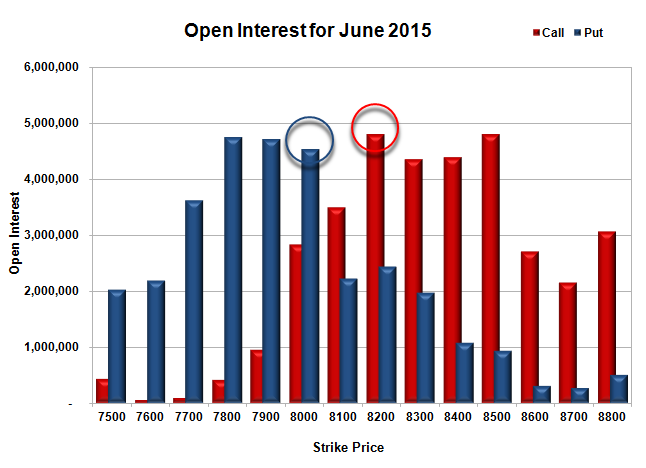 Initial support now at 8100, with OI of 41.33 lacs and below that at 8000 with highest OI of 63.37 lacs. Initial resistance at 8200, with OI of 42.24 lacs and above that at 8300 with OI of 51.34 lacs. 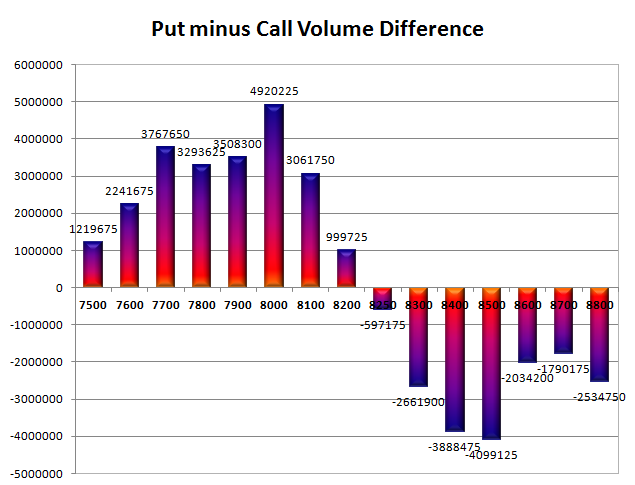 Day Range as per Option Table is 8082 - 8236 and as per VIX is 8106 - 8243 with 8154 as the Pivot. The Index opened strong around 8084 and after an initial dip, moved up to cross 8100 and made a high of 8137, only to falter in the last 30 minutes to close at 8091.55, still gained 44.25 points. The broader market was positive, with 1033 advances to 451 declines. The broader range as per Option Table stays at 7800-8500. 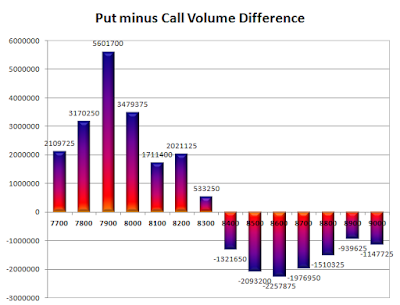 Call option 8100, 8300 added huge 11.77 lacs OI with short covering seen at 8000 and below strike prices. Put option 8100-8000 added 8.22 lacs OI with profit booking seen at 7900 and below strike prices. 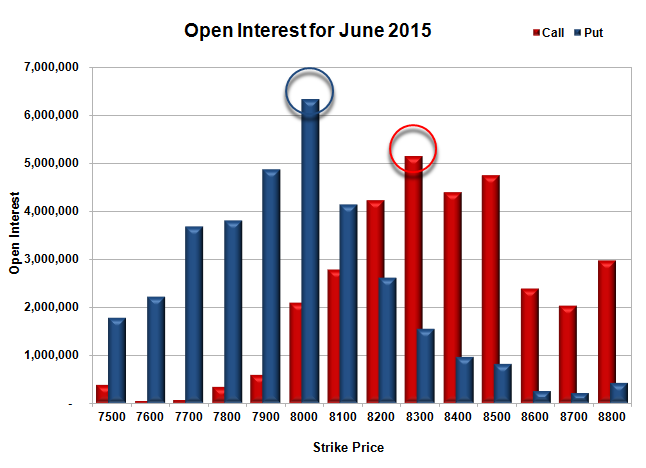 Nifty Open Interest is at 1,56,44,450 up by 94,875, with increase in price, most probably long build-up. 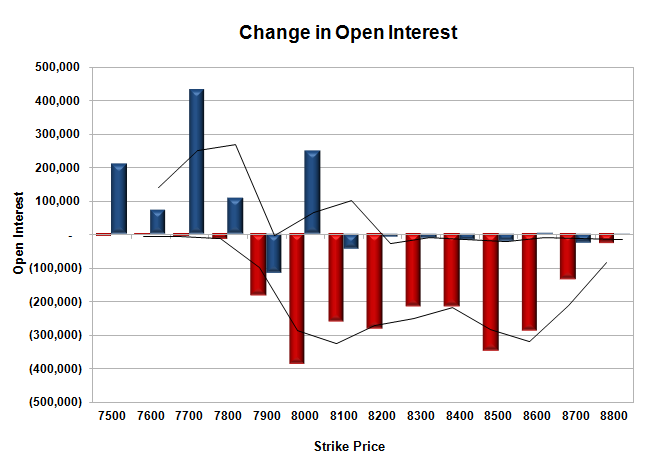 Bank Nifty Open Interest is at 27,61,100 down by 80,950, with decrease in price, most probably long liquidation. FII’s sold 1.37 lacs Futures, which includes 5755 contracts long liquidation and 273 contracts short covering, with decrease in net OI by 6028 contracts (includes 107753 longs to 113235 shorts for the day) and the Average Price comes to 8741.95. FII’s Index future open contract as on date is 313960 Longs to 358097 Shorts, Net Short 44137 contracts. 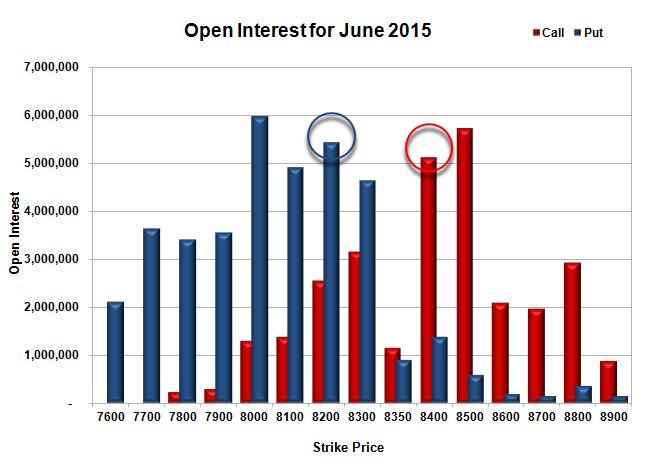 Initial and super support at 8000, with huge OI of 49.29 lacs and below that at 7900 with OI of 41.91 lacs. 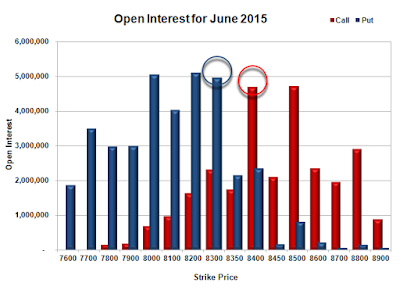 Initial resistance still at 8100, with OI of 41.31 lacs and above that at 8200 with OI of 45.29 lacs. Day Range as per Option Table is 8014 - 8170 and as per VIX is 8021 - 8162 with 8092 as the Pivot. The Index opened flat to weak and stayed in the red for the better part of the day, but a short covering rally towards second half saw the index close positive at 8047.30, gain of 33.40 points. The broader market was positive, with 756 advances to 714 declines. The broader range as per Option Table stays at 7800-8500. Call option 8200 added 3.93 lacs OI with short covering seen at 8000 and below strike prices. 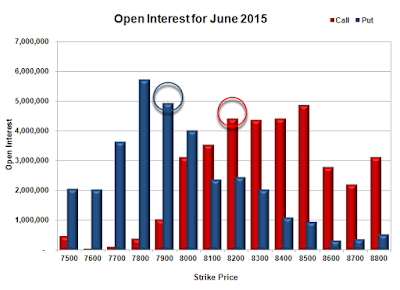 Put option 8000 added 5.21 lacs OI with profit booking seen at 7900 and below strike prices. 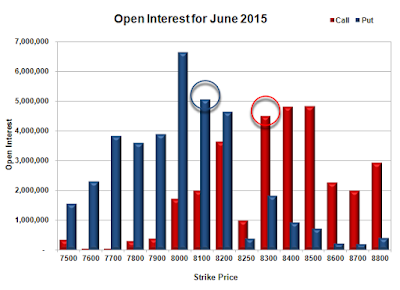 Nifty Open Interest is at 1,55,49,575 down by 3,46,200, with increase in price, most probably huge short covering. Bank Nifty Open Interest is at 28,42,050 up by 68,200, with increase in price, most probably long build-up. FII’s sold huge 7.67 lacs Futures, which includes 34566 contracts long liquidation and 3879 contracts short covering, with decrease in net OI by 38445 contracts (includes 53460 longs to 84147 shorts for the day) and the Average Price comes to 8708.99. FII’s Index future open contract as on date is 319715 Longs to 358370 Shorts, Net Short 38655 contracts. 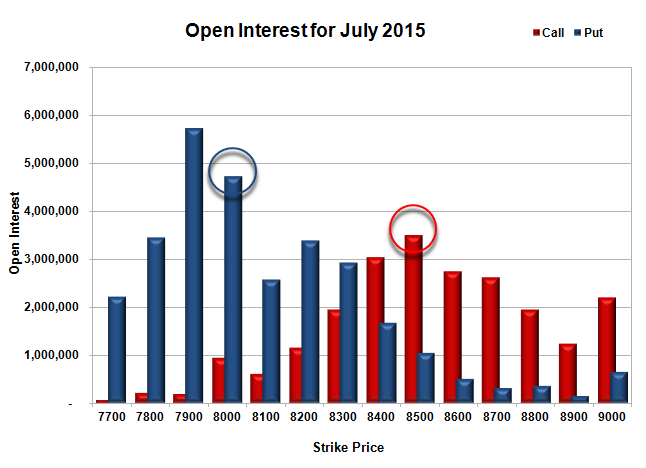 Initial support getting better at 8000, with OI of 45.42 lacs and below that at 7900 with OI of 47.12 lacs. 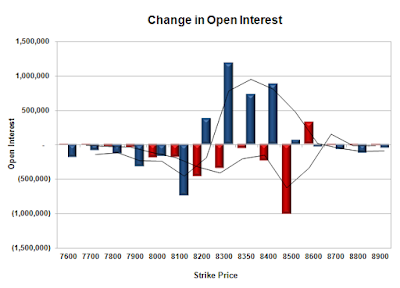 Initial resistance still at 8100, with OI of 34.90 lacs and above that at 8200 with OI of 48.09 lacs. 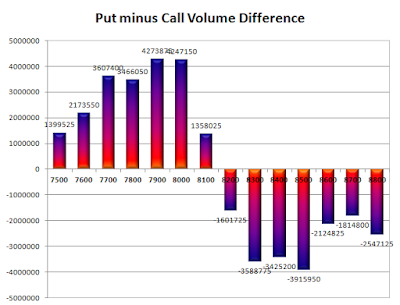 Day Range as per Option Table is 7947 - 8107 and as per VIX is 7975 - 8120 with 8021 as the Pivot. The Index opened flat and went on to touch the lows of the day at 7945 within the first minute itself but saw buying interest from the lows to close above the psychological level of 8000 at 8013.90, gain of 31.00 points. The broader market was positive, with 824 advances to 646 declines. The broader range as per Option Table stays at 7800-8500. 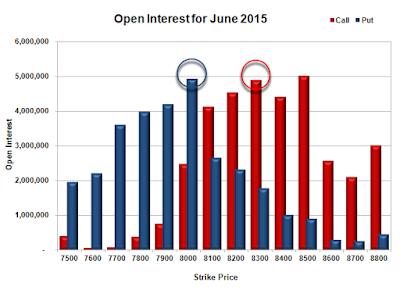 Call option 8250 added 1.70 lacs OI with short covering seen at 8000 and below strike prices. Put option 8000-7500 added huge 10.72 lacs OI with profit booking seen at 7900 strike price. 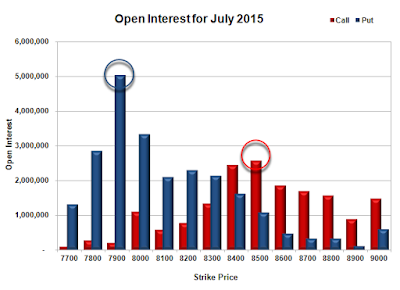 Nifty Open Interest is at 1,58,95,775 down by 7,61,950, with increase in price, most probably huge short covering. 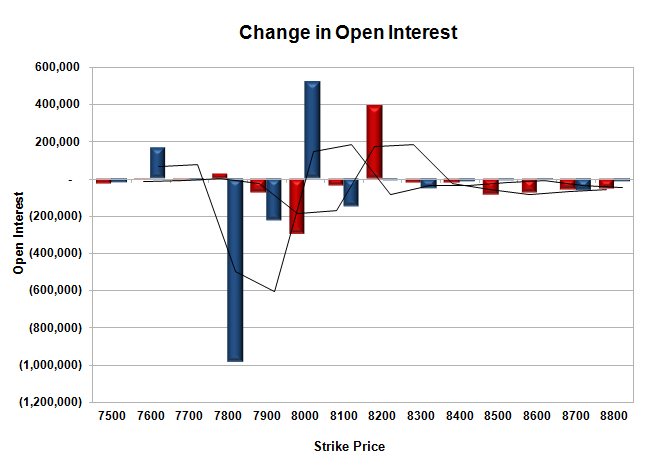 Bank Nifty Open Interest is at 27,73,850 up by 1,55,750, with decrease in price, most probably huge short build-up. FII’s sold 3.70 lacs Futures, which includes 14781 contracts long liquidation and 24 contracts short build-up, with decrease in net OI by 14757 contracts (includes 49681 longs to 64486 shorts for the day) and the Average Price comes to 8566.83. FII’s Index future open contract as on date is 354281 Longs to 362249 Shorts, Net Short 7968 contracts. Initial support at 8000, with OI of 40.20 lacs and below that at 7900 with OI of 49.38 lacs. 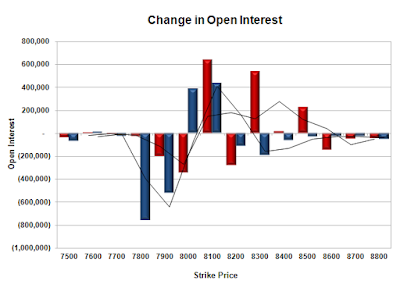 Initial resistance at 8100, with OI of 35.30 lacs and above that at 8200 with OI of 44.17 lacs. Day Range as per Option Table is 7929 - 8088 and as per VIX is 7940 - 8087 with 8005 as the Pivot. The Index opened flat and stayed in a narrow oscillating between red and green to close just a bit up at 7982.90, small gain of 17.55 points. The broader market though was weak, with 601 advances to 871 declines. 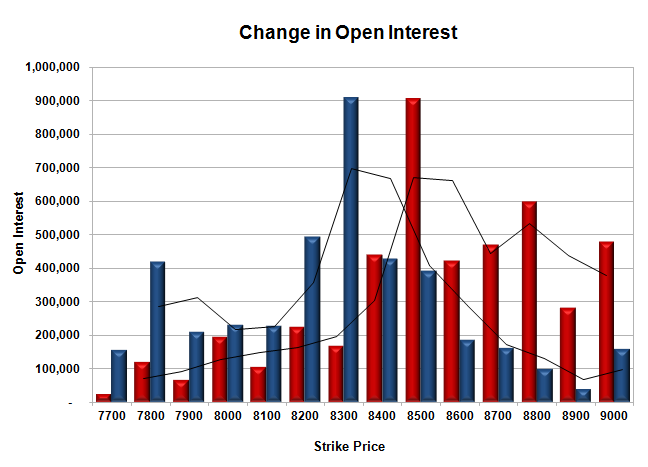 The broader range as per Option Table stays at 7800-8500. 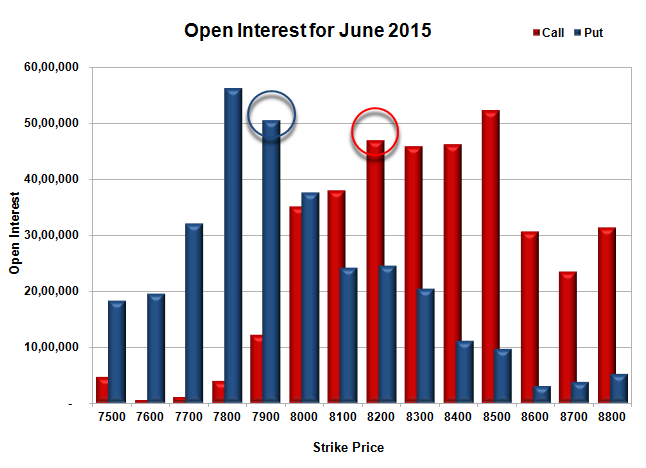 Call option 7900-8200 added huge 13.26 lacs OI with profit booking seen at 8300 and above strike prices. 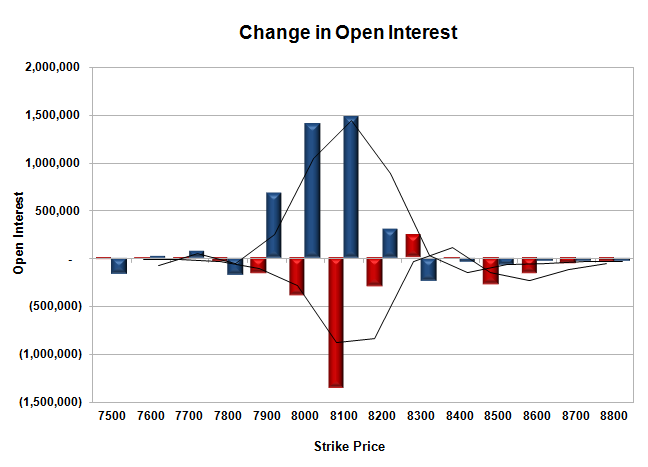 Put option 7900-7700 added huge 10.62 lacs OI with short covering seen at 8000 and above strike prices. Nifty Open Interest is at 1,66,57,725 up by 66,950, with increase in price, most probably small long build-up. 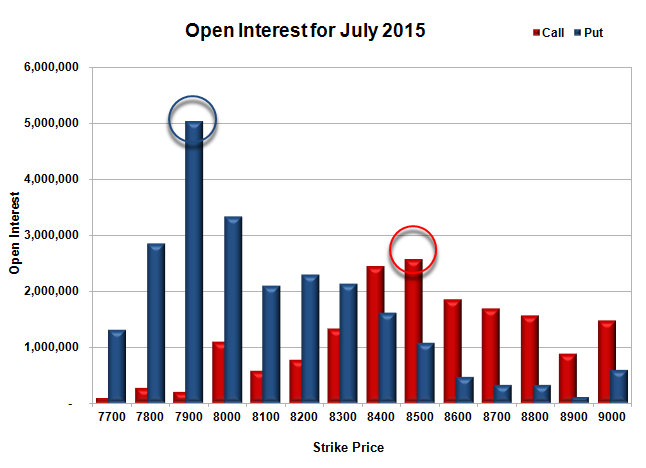 Bank Nifty Open Interest is at 26,18,100 up by 1,15,025, with increase in price, most probably huge long build-up. FII’s sold 2.64 lacs Futures, which includes 16099 contracts long build-up and 26645 contracts short build-up, with increase in net OI by 42744 contracts (includes 67053 longs to 77599 shorts for the day) and the Average Price comes to 8462.85. 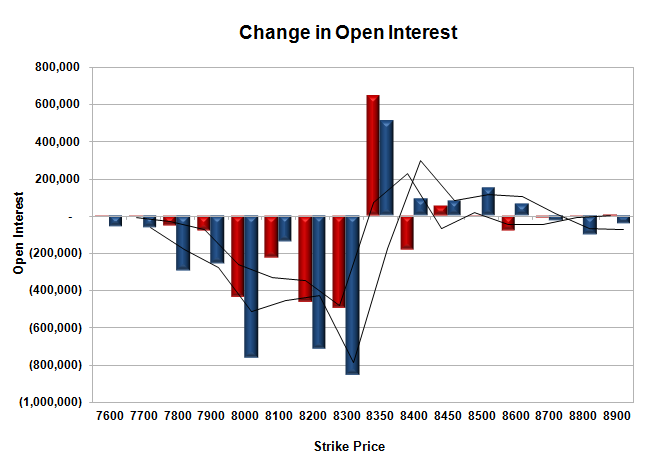 FII’s Index future open contract as on date is 369062 Longs to 362225 Shorts, Net Long 6837 contracts. 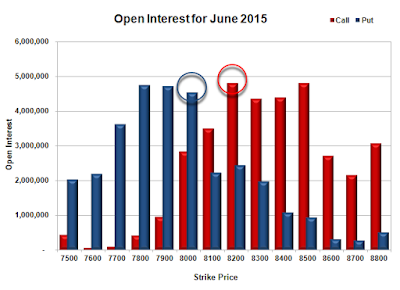 Initial and good support at 7900, with OI of 50.53 lacs and below that at 7800 with highest OI of 56.23 lacs. 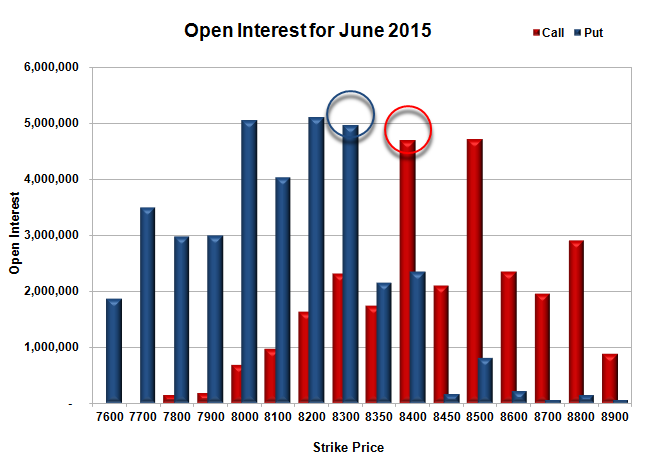 Initial resistance at 8000, with OI of 35.11 lacs and above that at 8100 with OI of 37.93 lacs. Day Range as per Option Table is 7897 - 8057 and as per VIX is 7910 - 8056 with 7973 as the Pivot.